The Māṇḍūkya Upanishad is so named, probably after its seer Rishi Mundaka. It belongs to the Atharva Veda group of Upanishads. In a short compass of only 12 mantrams, Māṇḍūkya Upanishad speaks of the entire range of human consciousness, beginning from the awakened state and ending in the Supreme Absolute state of super-consciousness where all objective relations and perceptions of duality are completely negated. May we Live with Contentment with Strong Body and Limbs. all that was, that is and that will be is the AUṀ. And also what is beyond all time is verily the AUṀ. and this Ātman is also Brahman. is the first foot (of the Ātman). is the second foot (of the Ātman). 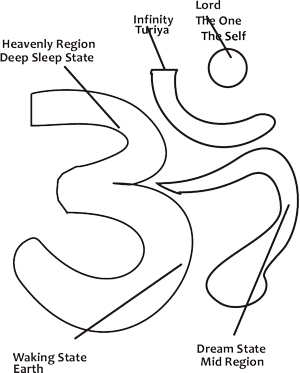 that state is the deep sleep state. and the cause of all (existence). - is called the fourth foot (of the Ātman). He is to be realised. i.e. the letters A, U and M.
- who knows it thus attains all desirable objects and priorities. the second syllable, from its superiority and intermediary nature. no person ignorant of Brahman is ever born in his family. on account of its being the measure and the final. and becomes the support of all. – thus AUṀ is verily the Ātman. By self he enters the Self, who knows thus!